As an environmental stewardship organization, our client’s value of building lightly on the land was of paramount importance. The selected site did not require the clearing of any additional land, nor was a single tree removed for the construction. The building pad location was selected based on its proximity to the existing developed areas of the property, as well as within an existing clearing. LEED credits for Erosion & Sedimentation Control, Reduced Development Footprint, and Minimized Site Disturbance were all earned for this project. On a more global level, minimal ecological impact was achieved through the use of renewable (solar) energy which supplies 100% of the building’s electrical needs, as well as through the used of recycled, locally harvested, and regionally manufactured products. No refrigerant cooling was used in the building, as the Learning Center also earned LEED credits for CFC Reduction and Ozone Depletion. Because the building was to be off-grid, many of the energy-efficient strategies selected were employed out of sheer necessity. 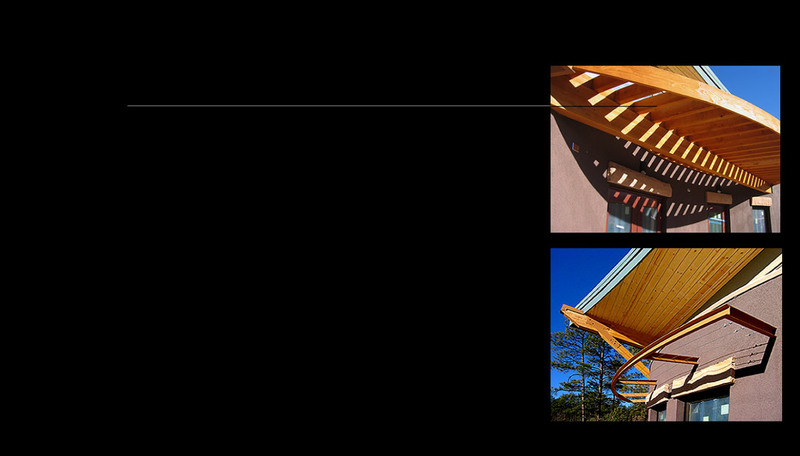 The most striking feature of the design, its “butterfly” roof, addresses several energy-saving strategies at once; providing the high clerestory windows for natural daylight and flow-through ventilation, as well as for passive solar optimization of winter-time solar gain, and summer-time solar shading. Combined, these energy efficient design strategies allow almost 70% of the building’s heating and cooling needs to be supplied passively. Another architectural feature of the design that provides for energy-efficiency are the building’s wood and metal trellises (images at right), positioned over the lower, eye-level windows along the structure’s south elevation. These engineered trellises were designed to support deciduous vines, allowing sunlight to penetrate these windows during the winter months, while shading them during the summer. The Learning Center’s appearance therefore takes on an intentionally different look throughout the year, as the building exterior literally “responds” to the seasons.